NEW YORK, NY--(Marketwired - Mar 20, 2014) - Baldwin Hardware, a leading brand of the Hardware & Home Improvement (HHI) division of Spectrum Brands Holdings (NYSE: SPB), today unveiled the Santa Monica™ collection, a sleek, modern offering expanding the brand's contemporary product portfolio at the 2014 Architectural Digest Home Design Show, booth number 297. In addition, Baldwin revealed plans to redesign its showrooms in 2014, as well as an upgraded web-based Lock Designer app intended to provide designers, architects, and homeowners with the ultimate tool for design creativity, flexibility and customization. "The new Santa Monica collection sets a bold tone for any room and truly embodies Baldwin's Own It positioning," said PJ Rosch, Baldwin brand manager. "This new collection reflects Baldwin's commitment to making a statement with unparalleled design, craftsmanship and quality, while we progress confidently and innovatively to meet changing industry trends and customer needs." The show marks the official launch of Baldwin's bold, new Santa Monica collection -- a stunning addition to the brand's prestigious Estate portfolio, which allows customers to create their own signature looks with unparalleled elegance and unrivaled quality. Developed exclusively by Baldwin's renowned in-house team of designers, Santa Monica puts a visual emphasis on vertical and horizontal lines, with a focus on pure geometry without sacrificing comfort. Baldwin makes a bold statement with Santa Monica's simplicity and clarity of form. Each piece boasts Baldwin's signature quality and craftsmanship, fashioned from solid brass and available in 20 different finishes. The brand's heritage of impeccable quality, dedication to detail and fine artistry shines through in the eye-catching luxury line created by Baldwin's masters of high-end hardware. Santa Monica includes five levers, four rosettes, one square deadbolt with single and double configurations, and handlesets in any lever/knob combination. Baldwin also revealed an unprecedented Lock Designer app featuring every handcrafted piece in the brand's luxurious Estate portfolio, along with 20 different finishes and a variety of style choices, which provides users the ultimate in design flexibility. Architects and designers can create easily create beautiful inspiration boards for their clients in a matter of seconds. The platform is the first of its kind to include the scope of customization, as well as environmental choices (e.g., contemporary, rustic, etc.). Users will delight in the Lock Designer app's ease of mixing and matching finishes, styles and products on a variety of doors and rooms. Looks can easily be saved and shared with a simple photo function, as well as built-in social media capabilities. Propelled by Baldwin's brand positioning and challenge for customers to "Own It," the company announced plans to completely redesign key showrooms. With these aesthetic overhauls -- complete with new colors, functionalities and configurations -- Baldwin will breathe new, contemporary life into its product displays. The modular redesigns will incorporate sophisticated lifestyle imagery conveying the elegant essence and prestige of the Baldwin brand. Many new displays will also feature an iPad with the new Lock Designer app, to help streamline the sales process and educate customers on the vast array of product options through virtual mixing and matching. The first showroom redesign will be Simon's Hardware in New York City on April 3, 2014. For more information about Baldwin and the Architectural Digest Home Design Show, visit www.baldwinhardware.com and www.archdigesthomeshow.com. Baldwin is part of Hardware and Home Improvement (HHI), a major manufacturer and supplier of residential locksets, residential builders' hardware and faucets with a portfolio of renowned brands, including Kwikset®, Weiser®, Baldwin®, National Hardware®, Stanley®, FANAL®, Pfister™ and EZSET®. HHI is a leader in its key markets with #1 positions in U.S. residential locksets (Kwikset), Canada residential locksets (Weiser), U.S. luxury locksets (Baldwin), and U.S. builders' hardware (Stanley-National Hardware), #2 in Mexico residential hardware (Fanal), and #3 in U.S. retail plumbing (Pfister). Headquartered in Orange County, California, HHI has a global sales force and operates manufacturing and distribution facilities in the U.S., Canada, Mexico and Asia. HHI is a division of Spectrum Brands Holdings, Inc. (NYSE: SPB). Spectrum Brands is a global, diversified consumer products company and a leading supplier of consumer batteries, residential locksets, residential builders' hardware and faucets, shaving and grooming products, personal care products, small household appliances, specialty pet supplies, lawn and garden and home pest control products, and personal insect repellents. Spectrum Brands employs over 13,500 employees worldwide and sells to the top 25 global retailers with products in more than one million stores. Baldwin makes a bold statement with Santa Monica's simplicity and clarity of form. 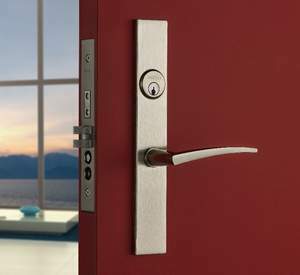 Santa Monica includes five levers, four rosettes, one square deadbolt with single and double configurations, and handlesets in any lever/knob combination.